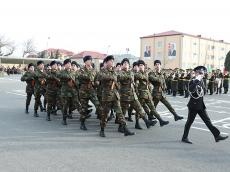 Another group of new army recruits took the oath of allegiance to the motherland in the N military unit of the State Security Service of Azerbaijan, Trend reports referring to the State Security Service. Afterwards, the combat flag was brought to the square. The unforgettable memory of the heroic sons of Azerbaijan, who gave their lives for the independence and territorial integrity of Azerbaijan, was honored with a minute of silence. The young soldiers then solemnly took the oath. Then the servicemen and the new recruits marched past the tribune, accompanied by the military march. Photos were taken in front of the monument to the national leader.